Place your comment below but don't forget to write your name first. All comments have to be approved by Mr Dowd before they go up on the wall. Lots of ideas for rewards and trips if we achieve our targets. Mr Dowd will speak to Mrs Hoffer about Assembly Superstars being on a Thursday now and also if we can fit two Book Swaps into the school year. Next steps - Ensure that all classes have jobs, targets and rewards. Also write their name for the superstar ready for Thursday assembly. 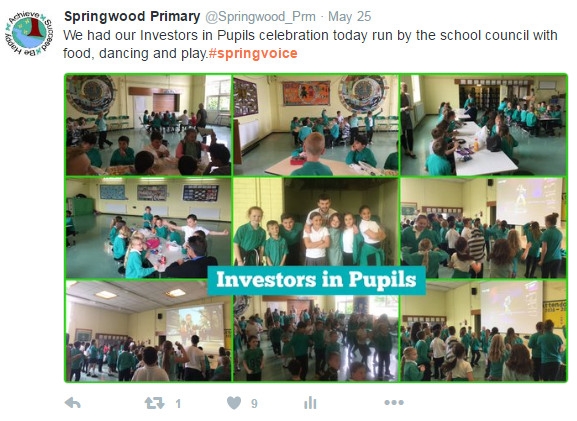 We discussed Investors in Pupils and most pupils said that there class are keeping up with it. 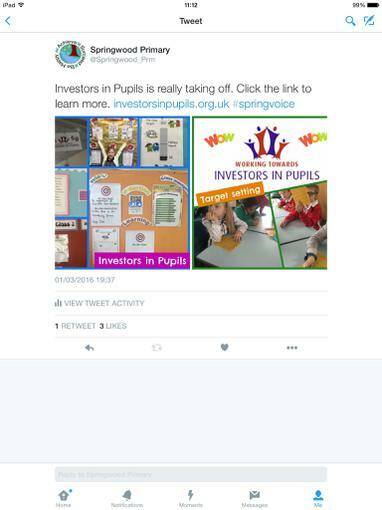 We sent extra reminders to those classes who might need a little help keeping up with Investors in Pupils. We looked at the learning wall and discussed the different comments on it. We noticed a few comments mentioned a Book Swap so we have decided to have another. 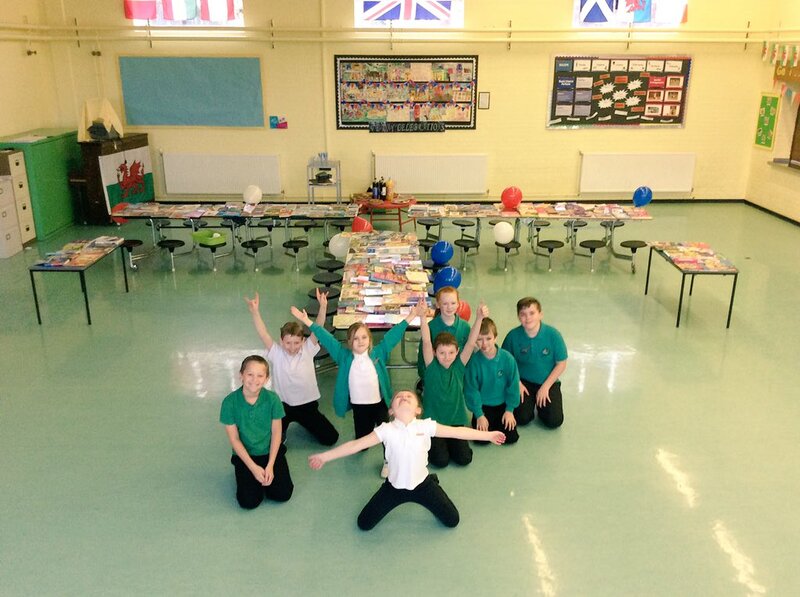 Each pupil can bring up to 5 books and for each book they bring they get a raffle ticket to a grand prize. Next steps - Promote Book Swap, make a trailer and show in assembly, buy a raffle book and grand prize. We had our big celebration of our award. 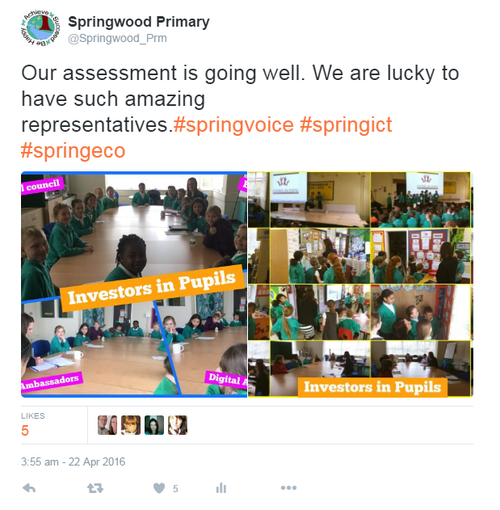 Next steps - We need to make sure that all staff and pupils keep up the excellent work that is in place. 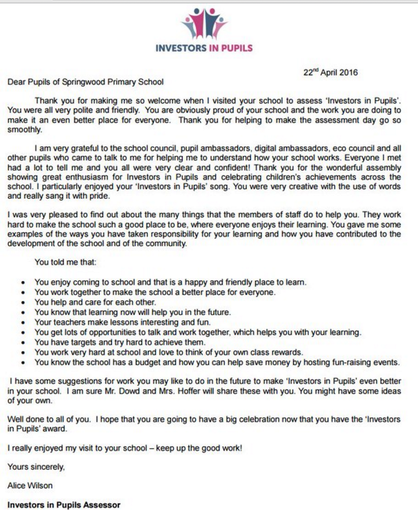 Super news we have been awarded the Investors in Pupils award! Click here to learn more. 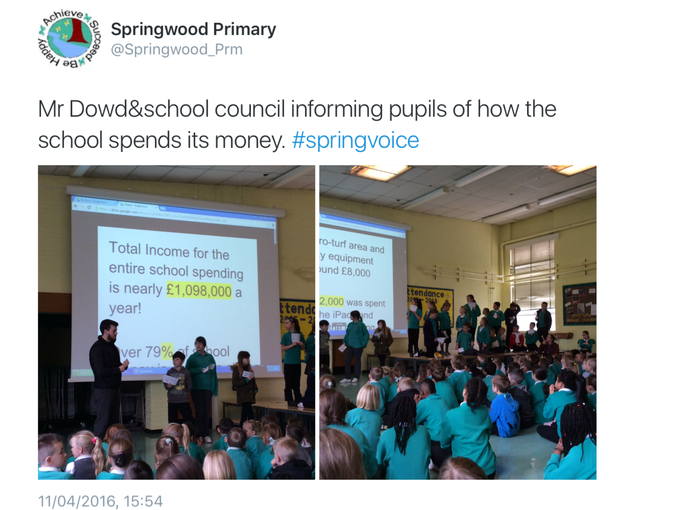 Today the school council and Mr Dowd met with the school and discussed how we spend the money that we are given by the government. A lot of the children were very surprised that we get so much but also equally surprised at how much money the school needs to spend to be the best school it can be. Click here to get a breakdown of what we spend our money on. Next steps - Governor Mrs Dorey to meet with the children in an assembly to remind them of the role of the governors in a school. 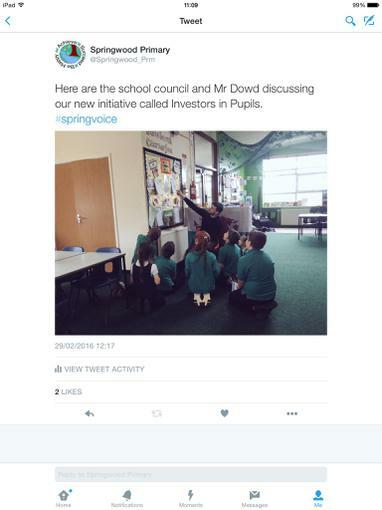 The school council and Mr Dowd discussed Investors in Pupils in the school. 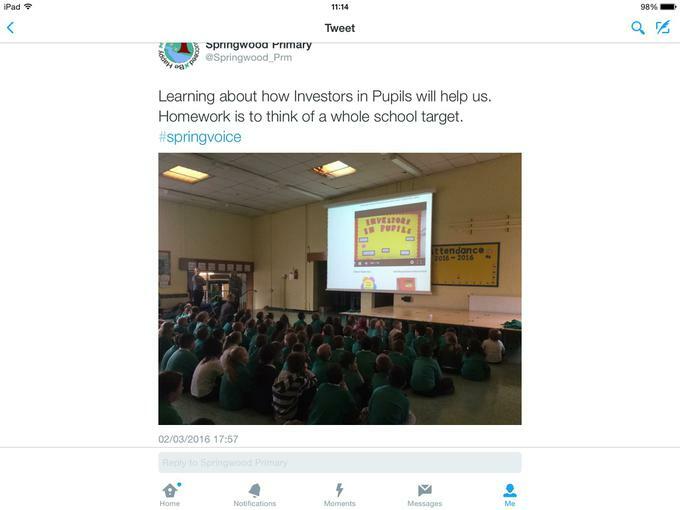 We talked about how it could improve the school and what it would bring to the pupils. We drew up ideas on how to implement it in the school. Next steps - Members of the school council to have a learning walk to see how classes are implementing Investors in Pupils within their class. Present - All members except Paige and Mr Dowd. Discussed assemblies and what we can do to improve the behaviour. 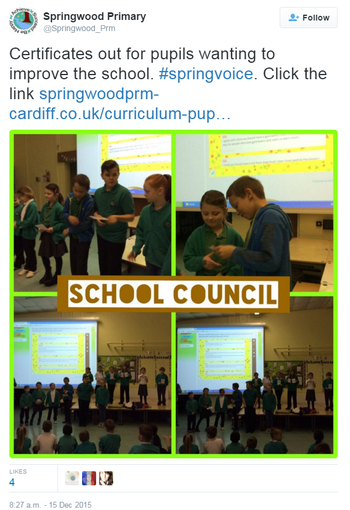 Eventually we came up with an idea of certificates for amazing pupils with the school council sitting at the side watching. 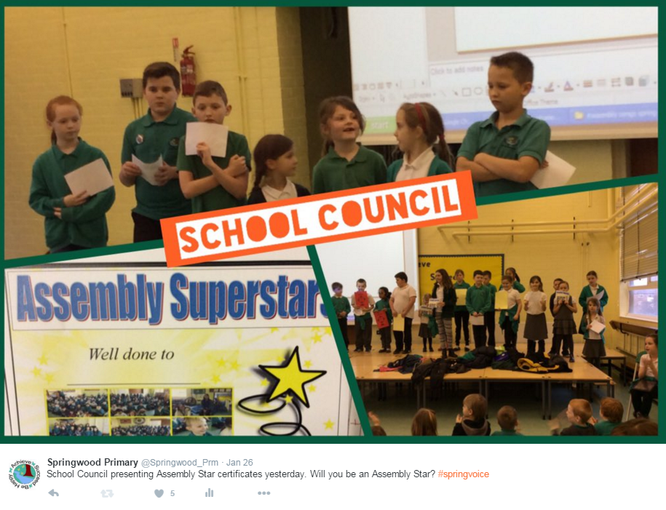 Next steps - Sit on the side of assemblies and present awards to Assembly Superstars. 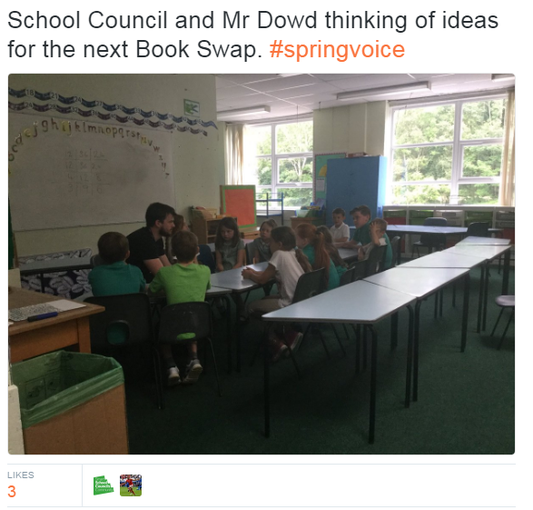 Next Steps - Discuss with pupils possibility about another Book Swap and maybe even achieving an award for the school because of our amazing pupil voice. 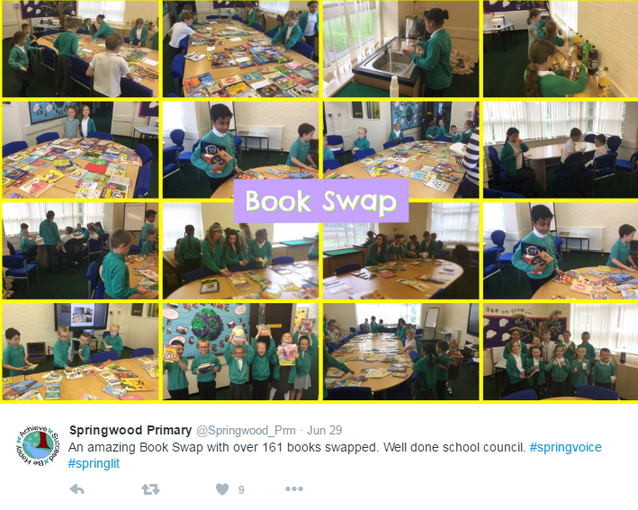 Super morning with over 271 books collected and swapped. 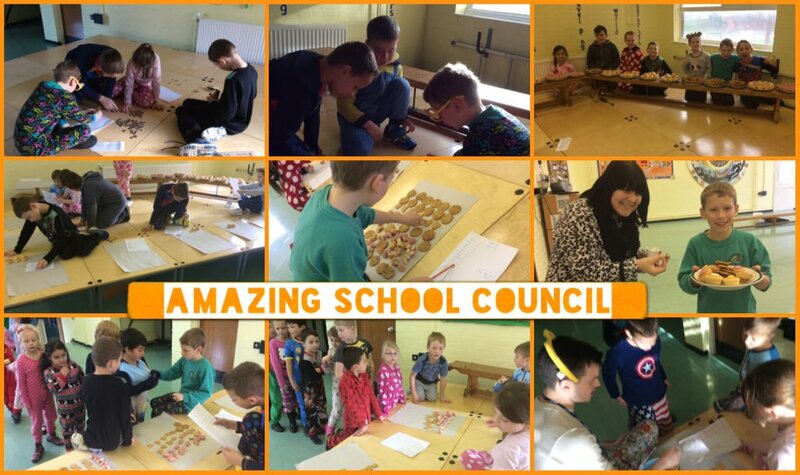 All the school council had fun collecting classes, sorting books, preparing the drinks and snacks, ticking boxes and so much more. Springwood is lucky to have such an enthusiastic and amazing School Council who want to promote the importance of reading in the school. Next steps - Choice a charity for the Christmas donations. 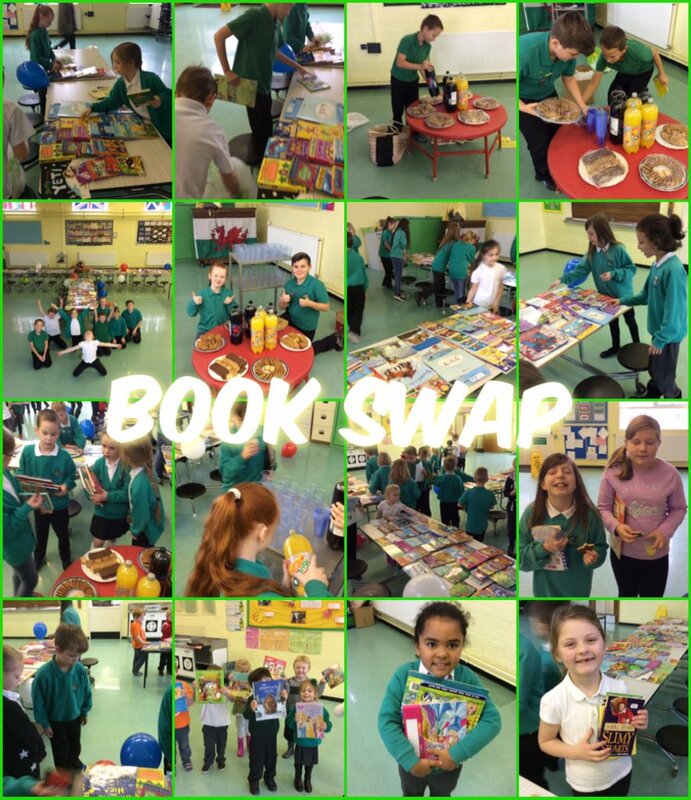 The School Council decided to make a new video to drum up interest and added a Book Swap Cafe to the Book Swap. All children who bring books can have a small drink and biscuit too. Here is the new video. We met and discussed the book swap. 1- 5 books for each class and the class that brings in the most books gets extra play and a box of treats. After much talk we decided to postpone the parents book swap until we see how this book swap goes. Classes will have sheets and Mr Dowd will give the teachers the sheets in the morning meeting for staff. 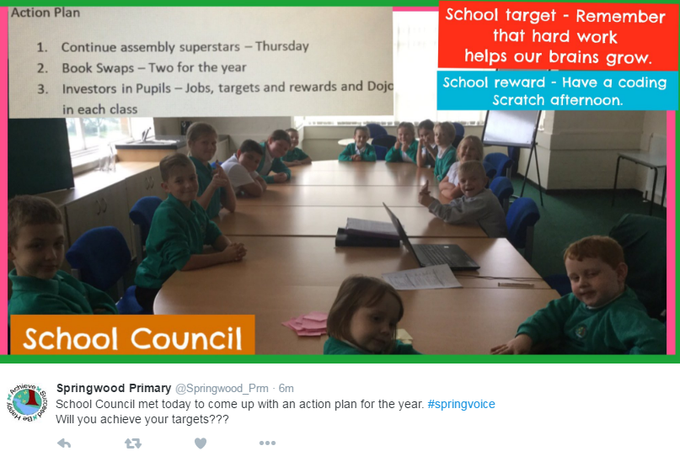 The school council will show the video during Good News Assembly on Monday. Next steps - Show video, collect books and run the event. Super Day with lots of amazing things going on. We were at the front of assembly presenting what Children in Need actually was about. We had fun getting all the cakes sorted for all the classes and then enjoyed helping to hand them out. Overall we raised about £150 so we were very pleased. 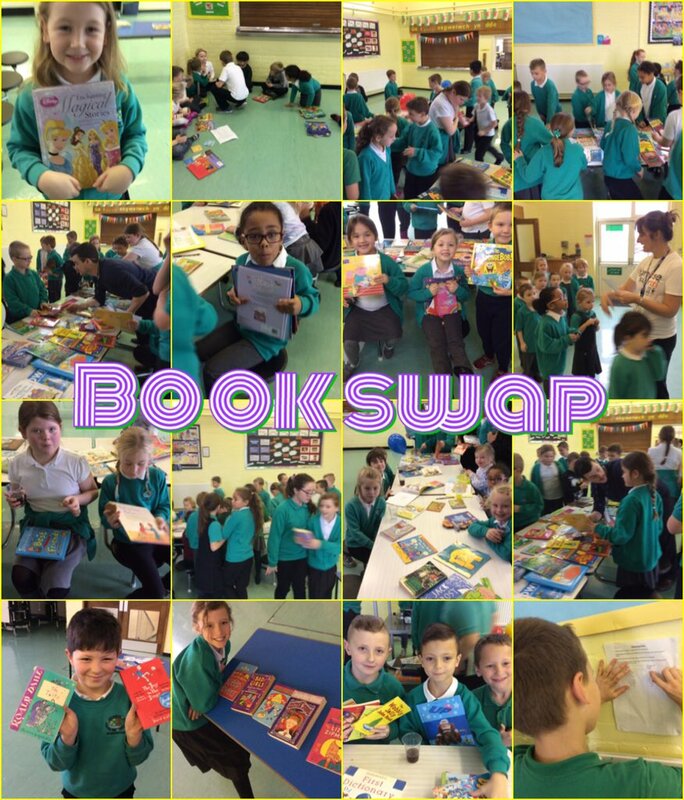 Next steps - Make a TV ad for Book Swap, put it in the newsletter, tell all the children about it and do the day on the 28th November. We met to discuss final plans for Children in Need. We ran out of time to do the sponsored walk so we have decided to have a sponsored skip in the hall with each class skipping for 30 mins and then passing the Pudsey bear to the next class. The cake and cookie sale is going ahead but selling for 20p only. Also all the children will wear pyjamis or onesies and bring in a £1 to do so. We were all very excited to get our new badges too. We left with a message to tell all the children about the £1 pyjamis, 20p cakes and cookies and skipping. Next steps - Promote the event in assmebly, have the event and sell the cakes. Mrs Williams in the office and Mrs Hoffer asked the school council to come up with some ideas for Children in Need this year. After a long discussion in Mr D's room we decided on this. 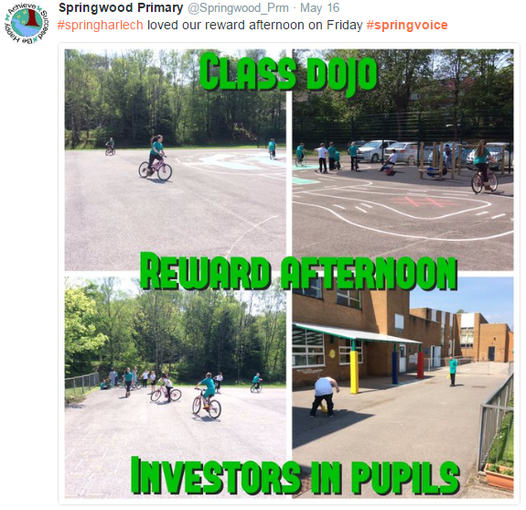 Raise money to do a Springwood Scramble - each class walking around the grounds and passing a Pudsey bear to the next class to take over. If we raise £200 (by pupils using sheets next week to collect) then the pupils who raise the most in each class will be allowed to throw a pie at a few volunteering teachers. 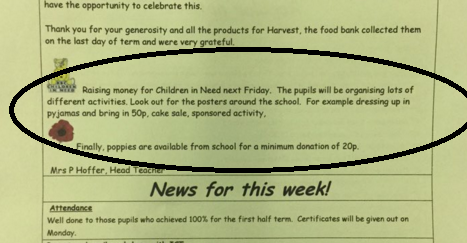 Pupils will be handed out sheets next money to raise money. Finally pupils agreed to sell cakes and cookies at 50p each. Next steps - Hand out sheets to raise money and promote Children in Need event in every assembly until the event. Here is a photo of the meeting happening Here we have asked Mrs Williams to put it on the newsletter. 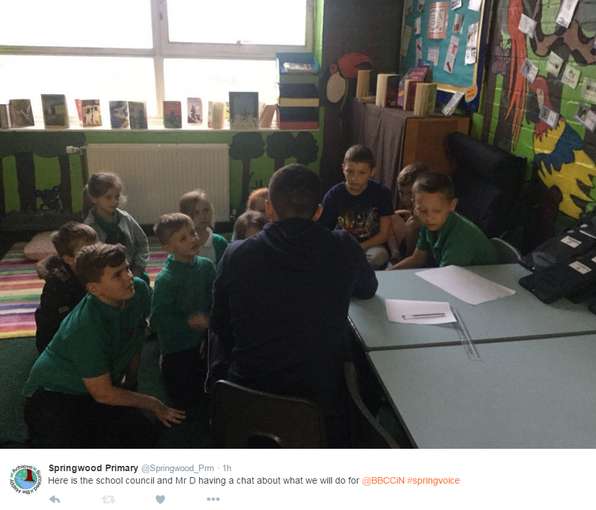 The pupils met in Mr Dowd's rooms and we talked about what whole school initiative we would run in the school. 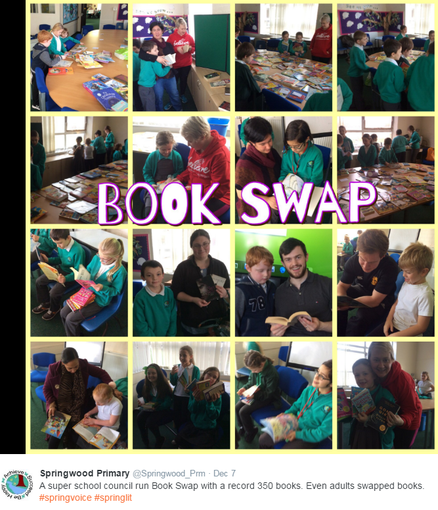 After lots of talk we decided on a Book Swap for children but also parents. 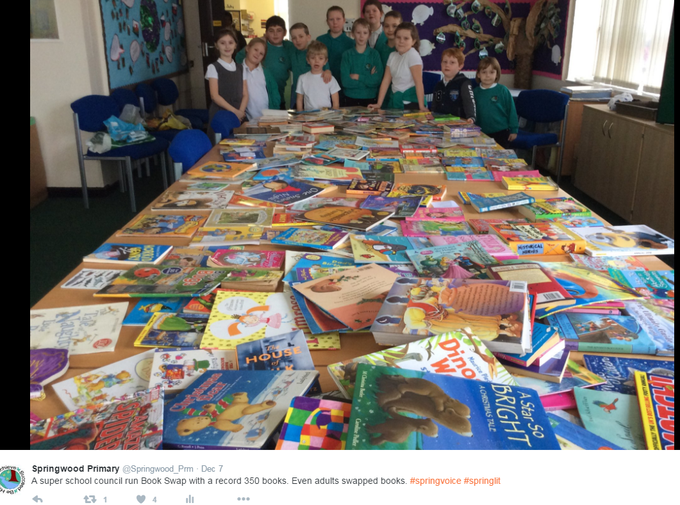 Children can bring in 1-5 books and on the 27th November classes will be called and who ever has brought in books can swap those books for other books brought in by children. We also would like to do this after school for parents after school on the Friday. We decided that we would make posters to advertise it. We also agreed to make a TV advert for the website and Twitter. Mr Dowd asked us if we should put it on the newsletter and we decided this would be a good ideas. Next steps - make poster, TV ad and post it on Twitter. 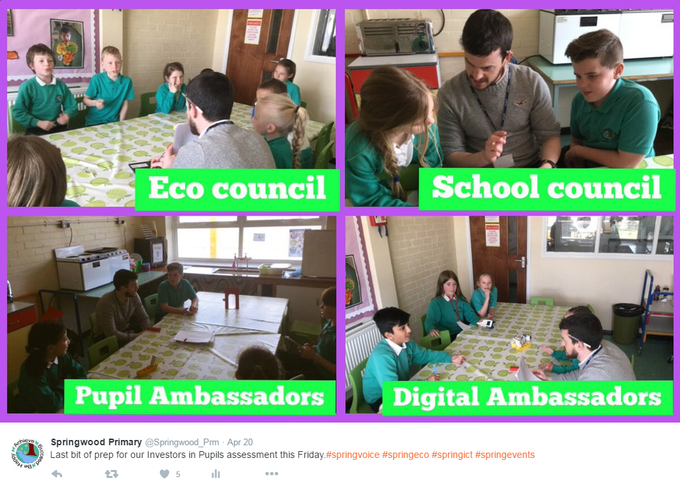 We met the Digital Ambassadors and discussed how we will work together to improve the school. 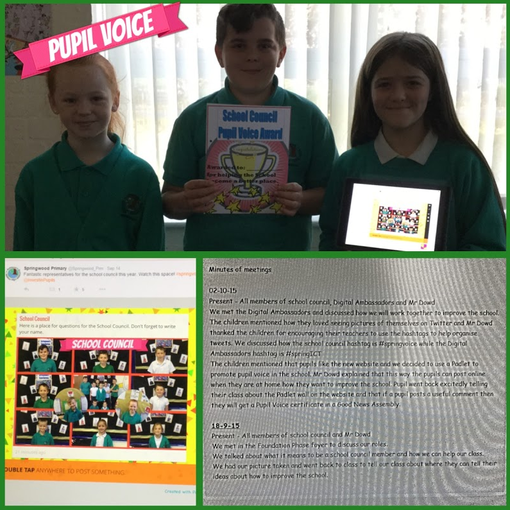 The children mentioned that pupils like the new website and we decided to use a Padlet to promote pupil voice in the school. 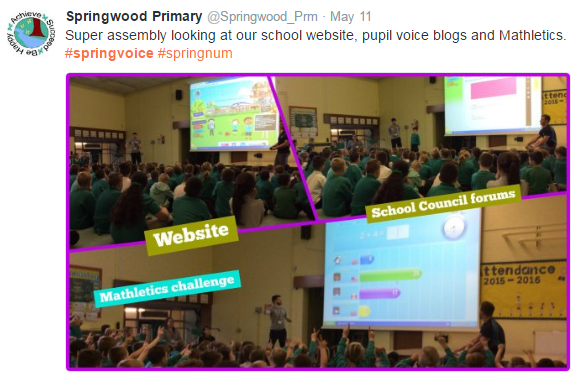 Mr Dowd explained that this way the pupils can post online when they are at home how they want to improve the school. 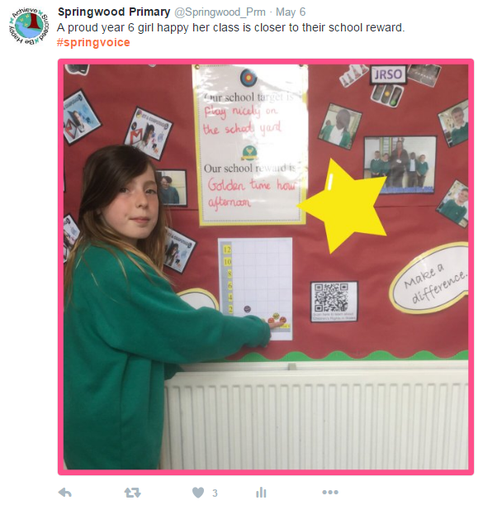 Pupil went back excitedly telling their class about the Padlet wall on the website and that if a pupil posts a useful comment then they will get a Pupil Voice certificate in a Good News Assembly. We talked about how amazing it would be if we ran an event to promote something in the school. Mr Dowd said he would talk to Mrs Hoffer about this. We met in the Foundation Phase foyer to discuss our roles. 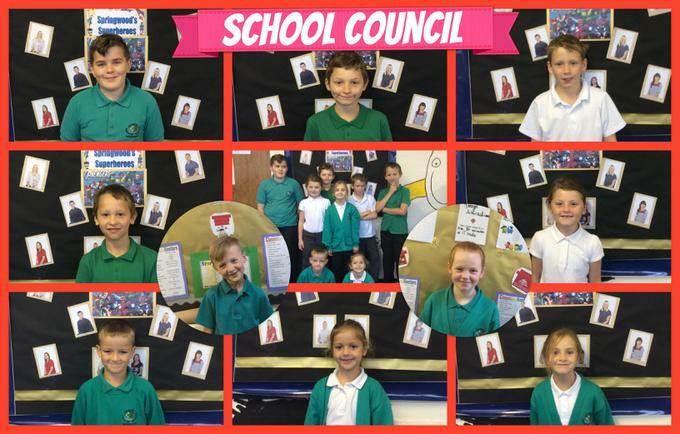 We talked about what it means to be a school council member and how we can help our class. We had our picture taken and went back to class to tell our class about where they can tell their ideas about how to improve the school.